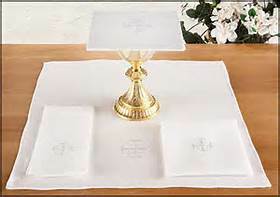 In the early church it is most likely that only one linen cloth was used to serve as both altar-cloth and corporal. These altar cloths generally would have been made of silk during this time and large in nature being able to double–back to cover the chalice. By the year 335, Pope Sylvester I ordered that the Holy Sacrifice should not be celebrated upon a silken or dyed cloth but instead on linen since linen springs up from the earth and is natural. Linen is also the burial cloth of Our Lord Jesus Christ. It is fitting that the altar cloth, corporal, and purificator would be made out of the same material by the Carolingian times. This is also the time, 700 – 800 AD that the altar cloth separates into two distinct pieces; an altar cloth and corporal. The use of three cloths were modified at Rome in the years 800 – 900 AD and during these same years the low mass was introduced. Some more changes then took place on the corporal in the middle ages, 1000 – 1300 AD. By then the corporal was gradually reduced in size. In the year, 1502 AD, according to the traditional liturgical rules, the corporal must not be left to lie open upon the altar. When not in use it should be folded and put away in a burse or a corporas-case. The corporal is now folded twice in length and twice in breadth. This is so in order that when folded it still forms a small square. 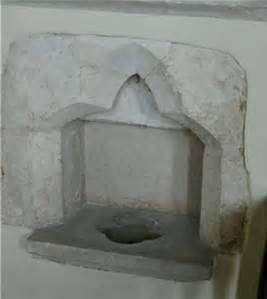 The year 1502 AD is also the year you’ll find the pall as a stiffened square piece of linen which fits over the chalice cup and the purificator now looking like a rectangular piece of linen cloth which is placed across the cup of the chalice. The cleaning of the chalice linens is very important. 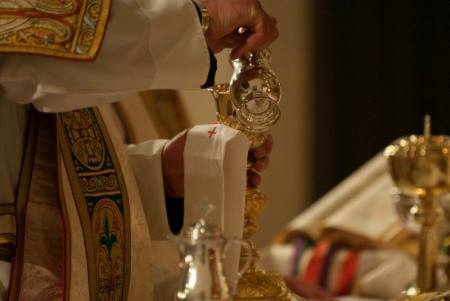 So important that the Bishop, during a subdiaconate ordination, informs them that the cloths which are used for the covering of the altar must be washed in one vessel; the corporals, in another. Where the corporals have been washed, no other linen is to be washed, and the water must be poured into the baptistery. Endeavor, therefore, to perform these material services properly and with careful attention, and in a like manner to fulfill the spiritual obligations symbolized by them. Other measures must be taken with the cleansing of Sacred linens such as; any linen that has touched the Sacred Species (corporal, pall, purificator; altar cloth due to accident), must undergo a special rinsing by the priest before laundering; the linens should be rinsed carefully in a separate basin of water, and the water poured into the sacrarium (not down the regular drain), or onto the ground. Roman Catholics usually refer to the drain, and by extension, the basin, as the sacrarium. They are often made of stone and fitted with a drain. The sacrarium is the drain itself. The purpose of the piscina or sacrarium is to dispose of water used sacramentally, by returning these particles directly to the earth. It is for this reason that the pipe is connected directly to the ground; otherwise presumably a basin was used. Lastly, there is a dispensation that exists for laity during missionary work.